Want an HP Workstation customized just for you? now to have a certified technician tailor your device. Delivering workstation-class performance within a desktop form factor, the EliteDesk 800 G4 Workstation Edition from HP is certified for professional software applications, including 2D/3D CAD design to VR content creation from Autodesk, SolidWorks, and more. The system is powered by a 3.2 GHz Intel Core i7-8700 Six-Core processor and 12MB of Intel Smart Cache, both of which will allow you to run multiple applications simultaneously and provide significant performance gains when running multi-threaded tasks. If more power is needed, the CPU can deliver extra performance by increasing its clock speed up to 4.6 GHz utilizing Intel's Turbo Boost 2.0 technology. The 8GB of 2666 MHz DDR4 RAM comes in a 1 x 8GB configuration and can be upgraded to a maximum of 64GB by using a 16GB module in each of the four 288-pin DIMM slots. For long-term storage of your files, this system is equipped with a 256GB NVMe PCIe M.2 SSD with Triple-Level Cell (TLC) NAND flash memory. If you want to add external storage drives, optical drives, printers, memory card readers, or other peripherals, the EliteDesk 800 G4 features one 10 Gb/s USB 3.1 Gen 2 Type-C port (front), four 10 Gb/s USB 3.1 Gen 2 Type-A ports (2 front, 2 rear), two 5 Gb/s USB 3.1 Gen 1 Type-A ports (rear), and four 480 Mb/s USB 2.0 Type-A ports, one of which doubles as a fast charging port. For users who wish to add additional components to the drive bays, there are a total of two 3.5" drive bays, one 2.5" drive bay, and two M.2 2280/2230 combo slots that use the PCIe x4 bus. HP's EliteDesk 800 G4 Workstation Edition includes a USB keyboard, a USB mouse, and a 6' power cord. The installed operating system is Windows 10 Pro (64-bit). B&H Photo is an authorized HP reseller with professional in-house technicians available for upgrades & installations on these workstations and laptops. Built with power and speed in mind, this workstation is designed to enhance audio and video post-production workflows and more. Each HP workstation or laptop features a range of top-tier processors and large RAM loadouts. The workstations are built with graphics flexibility in mind as well so that the end consumer can configure the graphics options to their needs, and each unit includes a 3/3/3 warranty - 3 years limited warranty for parts, 3 years limited warranty for labor, and 3 years of repairs performed at customer site for those parts not eligible for Customer Self Repair (CSR). For 24/7 customer service, please call 1-800-334-5144. The EliteDesk 800 G4 Workstation Edition has one PCIe 3.0 x16 slot wired as x16, one PCIe 3.0 x16 slot wired as x4, and two PCIe 3.0 x1 slots wired as x1. 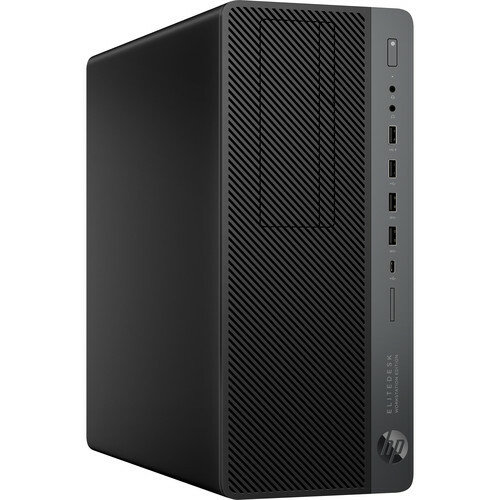 The EliteDesk 800 G4 Workstation Edition has one external 5.25" half-height bay. The EliteDesk 800 G4 uses the Conexant CX20632 HD stereo codec and all audio ports are 3.5mm and support stereo sound. There is one front headset connector that supports a CTIA style headset and is re-taskable as a line-in, line-out, microphone-in, or headphone-out port. There is also one front headphone port, a rear line-out port, and a rear line-in port which is re-taskable as a microphone input. The 500W internal power adapter is up to 92% efficient with active PFC. Work with confidence knowing your desktop is certified for your most critical applications. HP has worked closely with leading software providers like Autodesk and SolidWorks to help ensure seamless and reliable performance at every stage of your workflow. Get powerful protection from evolving malware threats with self-healing, hardware-enforced security solutions like HP Sure Start Gen4, which protects against BIOS attacks. Keep your critical applications and processes running even if malware tries to shut them down with self-healing protection with HP Sure Run, and HP Sure Recover enables you to quickly and securely restore your system to the latest image using only a network connection. Plus, easily manage multiple devices with the HP Manageability Integration Kit Gen2. Box Dimensions (LxWxH) 20.0 x 18.5 x 11.0"